Caring too much can hurt. Your utmost priority is to take care of others, but what about yourself? When we focus on loved ones we often start to feel burn-out. Apathy, isolation, bottled up emotions and substance abuse head a long list of symptoms associated with the secondary traumatic stress disorder now labeled: Compassion Fatigue. 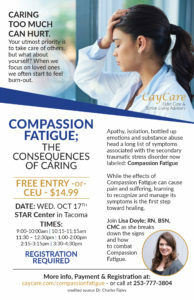 While the effects of Compassion Fatigue can cause pain and suffering, learning to recognize and manage its symptoms is the first step toward healing. 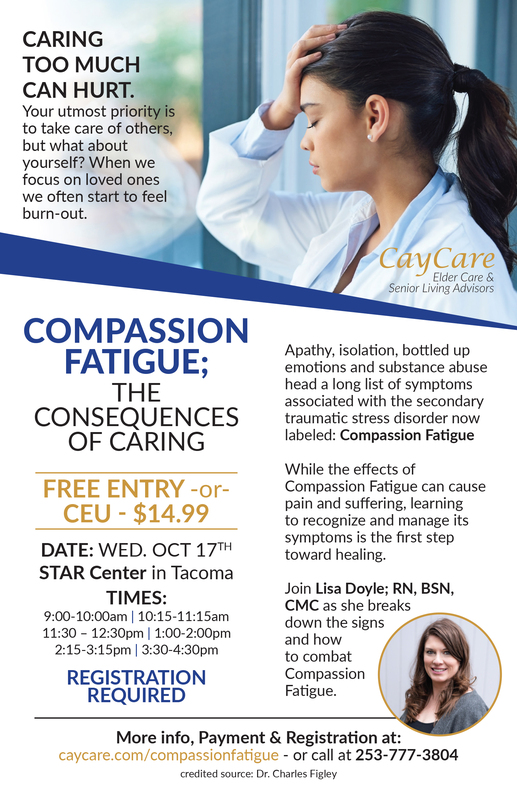 Join Lisa Doyle; RN, BSN, CMC as she breaks down the signs and how to combat Compassion Fatigue. FREE entry or $14.99 for Healthcare Professionals seeking 1 CEU.